Dummy Never Fails is a Physics-based puzzle game created by Xavier H. Divison and Israel A. Carroin. Your goal is to throw dummies like a ragdoll to reach the target, without causing to much pain. This game reminds a lot of Ragdoll Cannon, with a very similar gameplay. 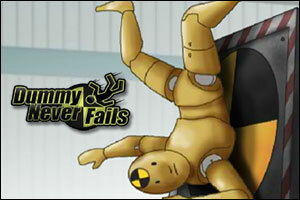 Dummy Never Fails is a polished game that comes with 52 levels of various levels. Dummy Never Fails video walkthrough! I got almost all skins i am just missing Total pain is less then 780,000 man i don’t even know what to do on that 1! i tried tht i did the whole thing and all it did was add more total pain damage 2 it wat do i do? hey guys i need help on how to get past level 38 any ideas? i can’t get passed that one either! Can somebody tell me how do i can gat “MECH” dummy if i have a total pain bigger than 780,000? samuria-get the pentagon symbol-how to do-use the empty middle right above laucher. how do you reload the game? HOW DO YOU BEAT LEVEL 38?! i have just got all skins. How do you go through level 38? Hey I need help How u send a medium or small level what does it mean by sending a small or medium can someone help plz? i dont no eether its no annoying cos there the last 3 skins i need!!!!!!!!!!!!!!! to send a level click save then press send. to send a small level just send a level with 1-14 objects on it. I cant get past level 51. If you want to make a large level put in blaster, target and loads of objects. hi, i need the walkthough of level 45! pleasee :) thank you. how do i send a level from the level editor????????? theres no send button!!!!! how do i get through level 17??? please,help! just shoot the thruster 2 times but leave a second before the second one…. How do you “Reload” the game to get stickman? hi how do i complete level 38???? anyone? shoot on the 2nd non-thrusted hole…. how do i get pass level 45? shoot the upper left movable block and wait for the movable ball to fall then the goal will show up…. how do u get passed level 51?????? Posted on Saturday, April 24th, 2010. Follow any responses through the RSS 2.0 feed.